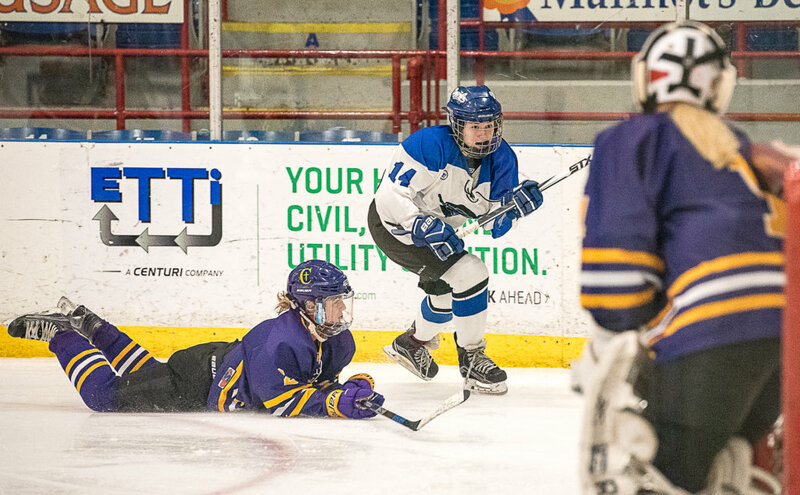 LEWISTON — Abby Lamontagne’s speed was on display all game, but when it mattered most she waited, and waited, and waited. 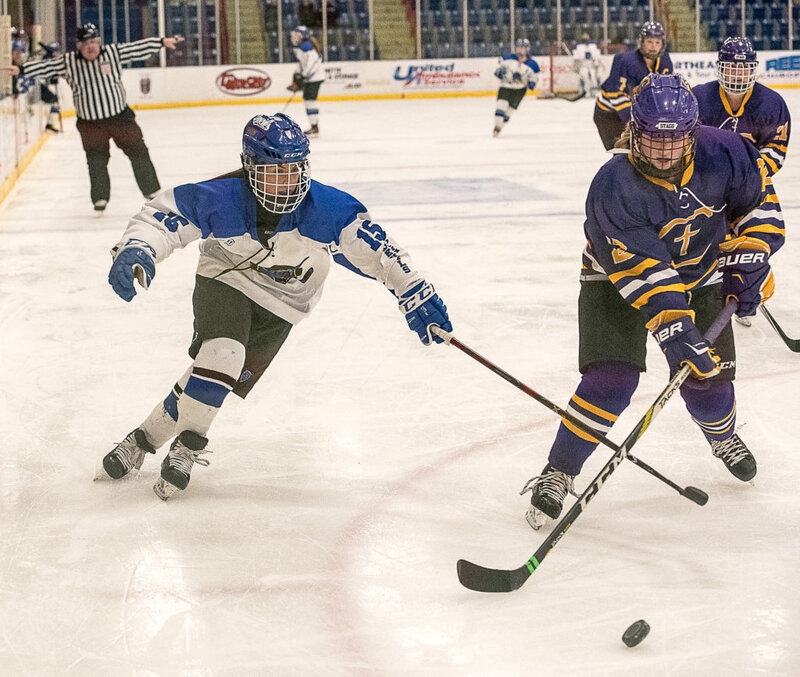 Lamontagne scored the game-winning goal in overtime for Cheverus/Kennebunk, to lift her team to a 4-3 win and hand Lewiston/Monmouth/Oak Hill its first defeat in a girls’ hockey clash at the Androscoggin Bank Colisee on Saturday night. 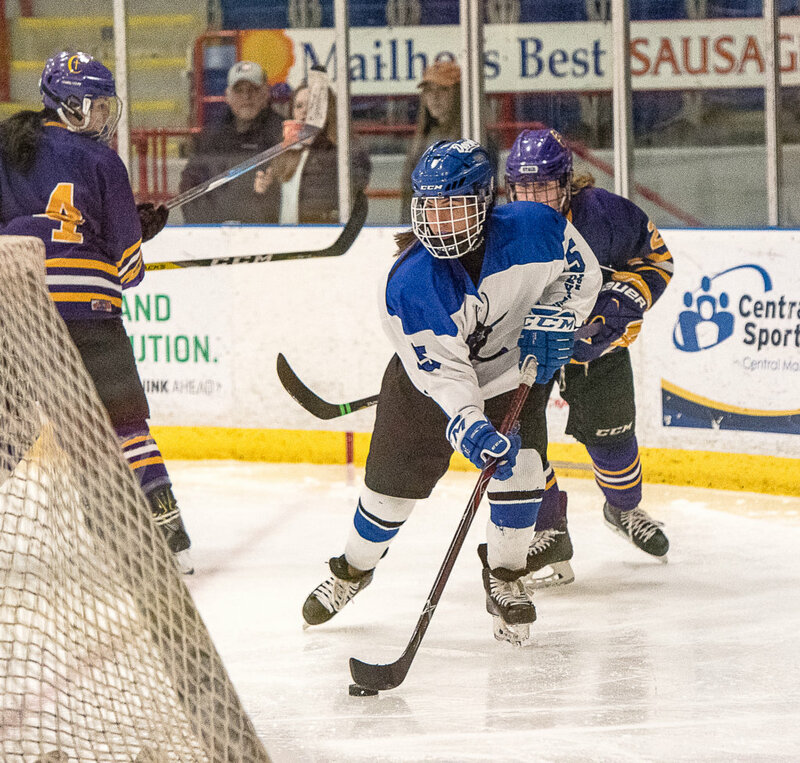 Lamontagne grabbed a rebound of a shot that sent Blue Devils goalie Camree St. Hilaire to the ice and she waited for the goal to open up. When it did, she flipped a shot into the back of the net with 2:18 left in the extra session to secure the victory for the Stags (11-1). The Blue Devils (12-1) shocked the Stags in the first minute of the game to take a 1-0 lead. Freshman Madison Conley finished from Sara Robert. The pair hooked up again for a second Blue Devils goal just under 10 minutes in, with Conley feeding Robert, whose dump-in got past Stags goalie Anna Smith. The Stags didn’t wait too long to answer, however. They went on their first power play within a minute and converted late in the man-advantage to cut the deficit to 2-1. Zoe Mazur’s point shot was deflected by McCauley and past Blue Devils goalie Camree St. Hilaire with 2:38 left in the first. Momentum stayed with the visitors into the second period. Pompeo finished a give-and-go with Lamontagne to tie the game 3:29 into the frame. Shots started flying by both teams, who each had unsuccessful power plays in the period, but the score stood at 2-2 heading into the deciding third period. “I was real proud of the way the kids hung in there. They could have easily dropped their heads and said ‘well this is going to fall apart,’ and they didn’t,” Dumont said. The intermission did the Blue Devils good. 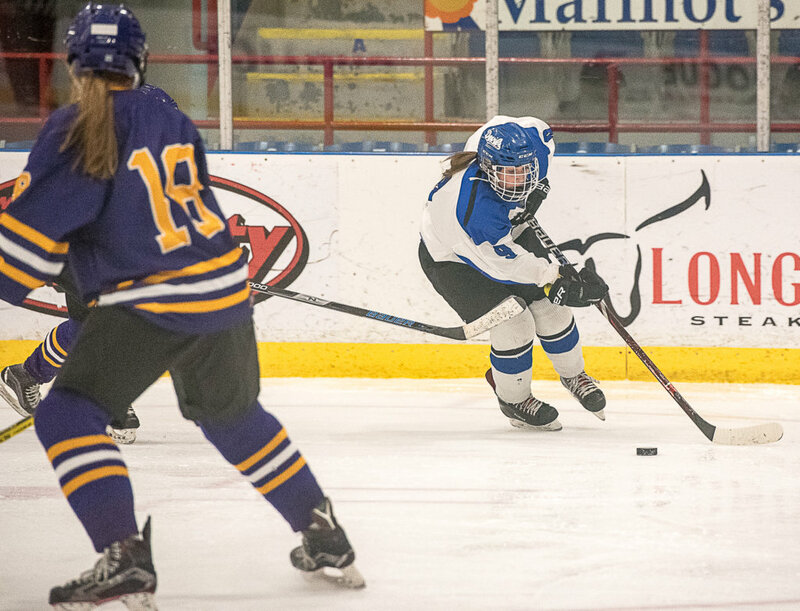 They came out stronger in the third than in the second, and Grace Dumond capitalized with a shot from the point that raced past Smith 5:30 into the period. 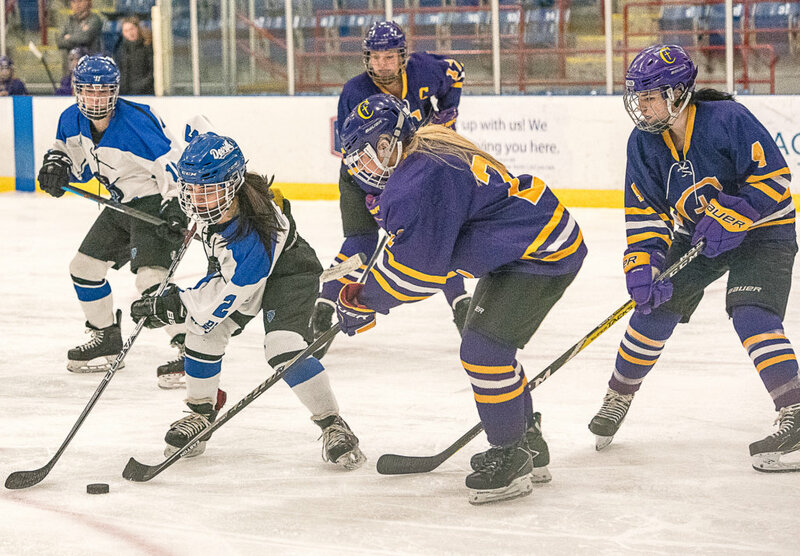 Lamontagne’s speed led to the game-tying goal with 1:26 left in regulation. She raced up the left boards on a counter attack before firing a shot past St. Hilaire. “In transition, they’re very good,” Dumont said. 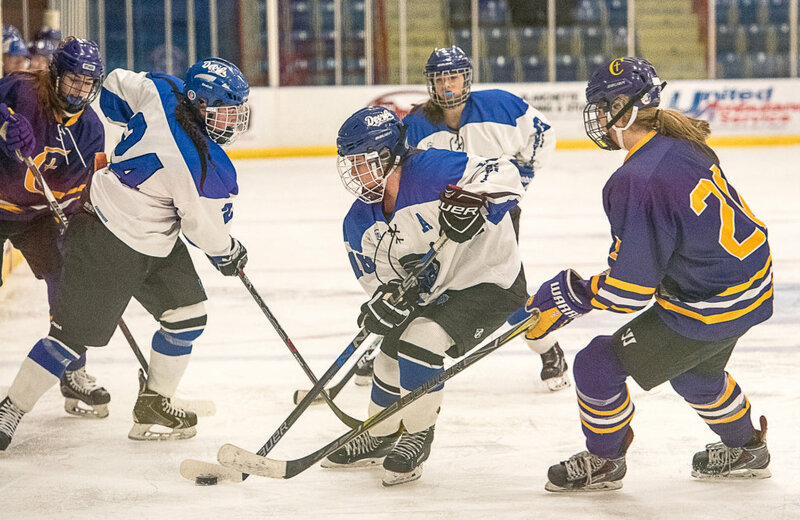 St. Hilaire stopped 31 of 35 shots for the Blue Devils. Smith made 21 saves.